ZEBULON, North Carolina -- The grieving family of a fallen American soldier received a $25,000 check from President Donald Trump on Monday, fulfilling a promise made months ago by the Commander in Chief during a condolence call. Chris and Jessie Baldridge, whose son Dillon died in June in Afghanistan, spoke exclusively with our sister station ABC11 after the check was delivered via FedEx from President Trump's New York address to their home in Zebulon, North Carolina. "I'm still speechless," Jessie Baldridge said. "We are so moved and grateful, and we promise to use the money to honor Dillon's legacy." The special delivery effectively ends an unprecedented exchange between Trump and the Baldridges, who said they received the original offer during a phone call in July. "We just thought he was saying something nice," Jessie Baldridge. "We got a condolence letter from him (a few weeks later) and there was no check, and we kind of joked about it. We didn't take to social media and didn't complain." A recent Washington Post article brought more attention to the offer - and the delayed response - prompting White House officials to issue a statement saying the check was in the mail. "There is a substantial process that can involve multiple agencies anytime the President interacts with the public, especially when transmitting personal funds," a White House official said on October 18. "The check has been in the pipeline since the President's initial call with the father. The President has personally followed up several times to ensure that the check was being sent. As stated earlier, the check has been sent." 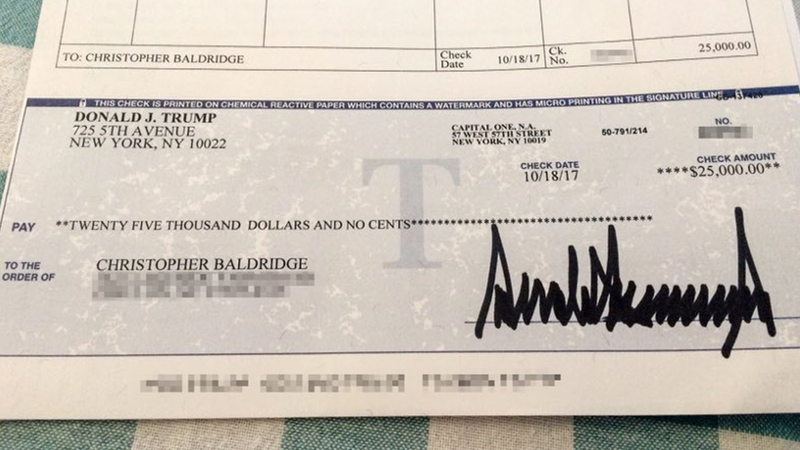 The check was dated for October 18, the same date the White House was asked about the check. Spokeswoman Lindsay Walters said any suggestion the president didn't intend to follow through on his pledge, despite the months that have passed, is unfair. "It's disgusting that the media is taking something that should be recognized as a generous and sincere gesture, made privately by the president, and using it to advance the media's biased agenda," Walters said. Still, it's not known whether the president has made any similar offers to other Gold Star Families, including those of the four soldiers killed in Niger, or even the other soldiers who died in the ambush attack alongside Dillon Baldridge. "We want you to know how grateful we are for this generous gift from you. We also want you to know that we intend to use this money to start a nonprofit organization in Dillon's name into something you can be proud of ... Our goal is to help as many fellow Americans as possible for the rest of our lives." The Baldridges said the nonprofit's mission is to make American flags and work with local schools in the process. The Taliban took responsibility for the attack that killed Baldridge and claimed one of its terrorists "infiltrated" the army to carry out the ambush, which killed two other soldiers. The 2012 graduate of Franklinton High School in Franklinton had always dreamed of being a soldier. "I feel betrayed," Chris Baldridge said. "(Dillon's) over there training people to take care of themselves and then they turn on us." Now four months later, the Baldridges continue to grieve and much prefer their focus and attention remain on their beloved hero. Dillon leaves behind his mother, stepparents, and four siblings, including a baby sister he'll never meet, He is buried at a military cemetery in Boone.